Whispers of war are heard in the Caucasus, as the anniversary of last year’s South Ossetian War approaches. Will the guns of August be fired in anger to mark the occasion? It was Georgia that attacked South Ossetia last year, mere hours after Saakashvili promised them peace and eternal friendship and candy. The Georgians proceeded to indiscriminately bombard Tskhinvali, a densely populated town full of civilians, with Grad missiles. They also attacked UN-mandated Russian peacekeepers, which constitutes a clear casus belli. Russia’s response was just and proportionate. The Western media at the time presented this as a struggle between aggressive Russian tyranny and democratic Georgia, spewing the most propagandistic bilge imaginable (e.g. headlines about Russia attacking poor little Georgia, while showing Georgian Grad rockets being fired at Tskhinvali!). Putin’s well-argued justifications of Russian intervention were censored and manipulated by CNN and Western journalists with enough personal integrity to refrain from unconditionally siding with Saakashvili were blacklisted. In reality there is much evidence, including the testimonies of former Georgian cabinet members, to the effect that Saakashvili was planning to retake the “lost territories” months beforehand. Since then the media retracted their most sensationalist claims in a bid to reinforce their (questionable) reputations for objectivity. Many media outlets now acknowledge the reality of Georgian aggression and war crimes. Amongst those who looked at the issue in detail, only the most diehard neocons and Russophobes still deny that it was Georgia that was primarily responsible for the war. In their circles, the idea of Russian war guilt is almost an article of faith. Applying Occam’s Razor would suggest they are wrong. Nonetheless, the US continues to unconditionally support Saakashvili, even under the Obama administration (whether this is because of American geopolitical interests, or because they really are hoodwinked by Georgian PR, is an exercise I leave to the reader). In doing so they turn a blind eye to Saakashvili’s repression of the opposition. This only serves to further reinforce the Russian conviction that the West cares about democracy only in so far as it advances its geopolitical interests. Far from pressuring the Russians to cease and desist, the West’s hostile rhetoric, encroachment on Russia’s security space and dismissal of Russian protestations will only reinforce Russia’s disillusionment with the West and make it ever more unwilling to consider Western interests. This disillusionment is especially prevalent amongst the Russian elites and younger people with Internet access. Thanks to the West, they are coming to the conclusion that no matter what their country does – right or wrong – it will be condemned by the champions of Western chauvinism regardless. The only way to make them the West happy would be to lie down and lick its boots, but few peoples anywhere think this way, let alone in a nation as proud as Russia. Though Georgia struck first, this war marked the most significant Russian retaliation to years of humiliations yet; it sent a message that it would no longer passively resign itself to Western imperialism. Look at the detailed Legal Case for Russian Intervention in Georgia by Nicolai Petro which looks at these issues in scholarly depth. All this may lead to a growing preference for Realpolitik over “liberal internationalist” solutions to Russia’s geopolitical problems, which will go in tandem with an internal power shift towards the hardliners. They are interested in more than just responding to external aggression against the Russian Federation; they want to redefine Russia itself. As I pointed out in my previous post Reconsidering Parshev, the weight of history is forcing Russia back to its future, the desires of its leadership regardless (let alone the desires of Westerners). This past-and-future is a Eurasian empire based on economic autarky, political sovereignty and spiritual sobornost. Amongst many other things, this implies control over the Caucasus. Georgia is the linchpin of the Caucasus. Securing a Russian-friendly government there will reinforce Russian control of gas flows from Central Asia to Europe, extend its influence over the Black Sea region and allow it to link up with its ally Armenia, which hosts a Russian military base. Nabucco will turn into a pipedream, at least as long as relations between Iran and the West remain strained. As Stratfor points out in Georgia: Left to Russia’s Mercy?, Georgia is not a strong nation. It is riven by divisions that could be exploited, e.g. separatist-minded Adjara and Armenian-populated Samtskhe-Javakheti. Its economy is dependent on agriculture and the government budget relies on pipeline rents. Meanwhile, Saakashvili’s brand of market fundamentalism may have provided a temporary boost from efficiency gains, but the attendant deindustrialization now limits its longer-term prospects. “Soft” measures failed to topple Saakashvili in the past year. He retains the approval of perhaps half the population, crushed an attempted military coup (or set it up himself) and now appears to be more secure in his position than he was in months. Another important point is that many elements of the Russian military were disappointed at being ordered to stop before overthrowing Saakashvili. They would love to finish the job (and furnish the excuse). That said, Saakashvili is hardly a peacenik either. According to Kirill Troitsky’s “War taught them nothing” in Voyenno-Promyshlenny Kurier, the Georgians have been rapidly rearming since 2008. Regaining control over South Ossetia and Abkhazia remains a strategic goal of the Georgian regime. Russia is upgrading and expanding its forces in South Ossetia and Abkhazia. It is renovating Soviet-era air and naval bases in Abkhazia, deploying its own border guards to the region (which increases the chances of an incident), kicking out foreign observers, and equipping the 131st Motor Rifle Brigade in Abkhazia with the latest T-90 tanks. 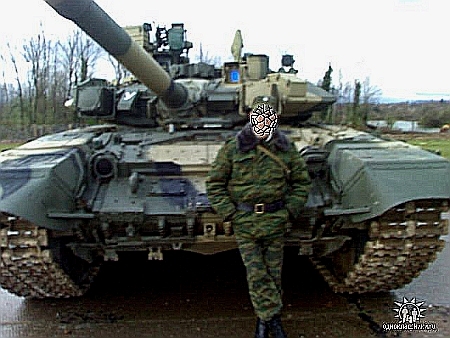 Below is a photo of a Russian soldier in Abkhazia posing in front of his new kit, first posted to the social networking site Odnoklassniki (the Russian Facebook). The focus on Abkhazia suggests that any Russian offensive would be focused on the west of the country, bypassing urban quagmires in Tbilisi. This would cut Georgia’s links to the Black Sea and sever the gas pipelines running across its territory. The Armenians may be persuaded to join in the dismembering of Georgia through the “liberation” of their compatriots in Samtskhe-Javakheti, through which Georgia would be cut clean in half. Azerbaijan would be cornered into quiescence. The main uncertainty is how Turkey would respond to such developments; it is not as pro-NATO and pro-West as it was a decade ago. Several commentators believe the risks of a new war are high. Stratfor believes Georgia will return into Russia’s fold by the early 2010’s, though it does not believe there will be a Russian military offensive this year. Vaha Gelaev, a former member of the now-disbanded “Vostok” Chechen battalion, is certain there will be war this summer. Pavel Felgenhauer has been raising the prospect of a new war since March in Wartime Approaching in the Caucasus and Risk Increasing of Russian Intervention in Georgia. Now he’s saying there’s an 80% chance of war breaking out this August. The Chechen terrorist site Kavkazcenter claims a 300-strong convoy of Russian tanks, BMPs, BTRs and multiple launch rocket systems are moving towards Georgia. If Russia were to attack Georgia, the optimal time would be August, before the autumn rains set in. That said, Felgenhauer is not a reliable military analyst. He predicted the Georgians would humiliate the Russian Army in a war. In conclusion, though innocent of starting last year’s Ossetia War, Russia made significant geopolitical gains and its elites became more disillusioned with the West. Control over South Ossetia and Abkhazia now make an invasion much easier to carry out than in 2009. The troops in the region conducted military exercises in July, they are being equipped with modern armaments and Russia’s naval forces in the region are recently very active. The main question is, are these forces meant to deter Georgia from another military attempt to reintegrate its “lost territories”, or are they to be the spearheads of a pre-meditated Russian aggression? I think somewhere in between, as is usually the case. Russia still respects its foreign relations enough, if not with the West then with the rest, to pay lip service to international law; however, it won’t hesitate to exploit any serious Georgian provocation. 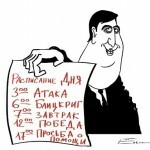 I don’t think Saakashvili is a complete idiot, so barring independent lower-rank Georgian military adventurism (or very skilled Russian feigning of said adventurism), the chances of war breaking out this August must be rather small. Perhaps 10-20%. We’ll see. In any case this August is going to be a tense and potentially very fun time in the Caucasus. And that’s not going to change any time soon, because based on current trends the reassertion of Russian power over the Caucasus is almost inevitable this decade.